February saw the first launch of SpaceX’s Falcon Rocket from Launchpad 39A – the same launchpad used by the Apollo missions and the Space Shuttle. In this month’s Pythagorean Astronomy, Edward Gomez and Chris North discuss these impressive structures along with the study of a supernova (the explosive death of a massive star) just hours after it exploded, providing crucial insights into the very early stages of these extreme events. 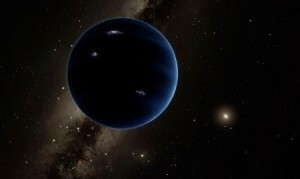 A new Zooniverse project, Backyard Worlds: Planet 9, was also announced designed to let “citizen scientists” (i.e. you!) help track down Planet Nine – whose existence was seriously proposed a year ago. Project leader Marc Kuchner told us about that project. For those wondering, we recorded this before the announcement of both TRAPPIST-1 and the SpaceX announcement of their planned lunar missions – but they’re pretty safe bets for discussion next month! An extended edition of the an original broadcast on 27th January 2017 as part of Pythagoras’ Trousers on Radio Cardiff. For an archive of Pythagorean Astronomy, visit pythagastro.uk. This entry was posted in Media, Radio on February 28, 2017 by Chris North. What’s really interesting about TRAPPIST-1? 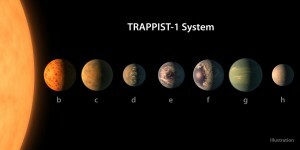 Earlier this week there was an announcement that a team of astronomers had discovered seven planets around a nearby star. That star is a cool dwarf star called “TRAPPIST-1”, and gets its name from the project that started this all off – the TRAnsiting Planet and PlanetIsimals Small Telescope (TRAPPIST), with a small (0.6m) telescope in Chile. 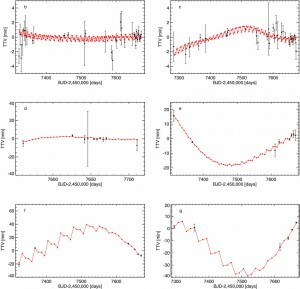 A few years ago the team running the telescope, led by Michaël Gillon and including many members from around the world (including the UK), spotted some unusual transits around a small, cool, red dwarf star that used to go by the name “2MASS J23062928-0502285” (the star was originally discovered by the 2MASS survey), but which is now commonly referred to as TRAPPIST-1. There were previously three planets known about (well, two for sure and another maybe). The new results have confirmed six, with another tentative seventh. All seven have been identified through the “transit method”, whereby the planets pass in front of the star from our point of view. This gives us an estimate of their size (relative to the star), but not their mass – at least that’s usually the case. The seven planets are labelled “b” to “h” (by convention, “a” is reserved for the star itself). 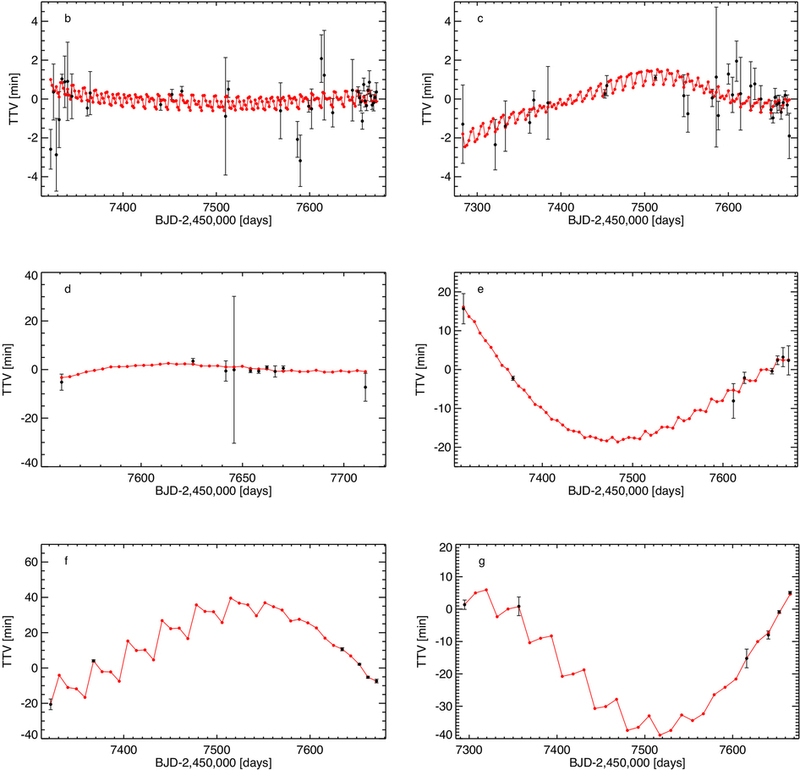 Finding Earth-mass planets isn’t new anymore. Finding lots of planets in one system isn’t new. Finding planets very close to Earth isn’t new. So what’s so interesting about TRAPPIST-1? I think it’s fair to say that the news was overhyped in much of the media coverage, I guess partially because of the embargo period which tends to get people wound up. 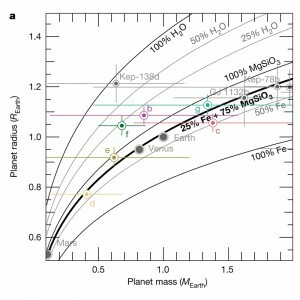 Getting people talking about exoplanets is good – but the community needs to be careful that people don’t think that these results are all the same, and so stop paying attention. Having said that, while some aspects of this result are “incremental”, there are some really neat bits in there when you dig down. The orbital periods of the planets (i.e. their years) are all less than a couple of weeks, putting them much, much closer to the star than any planets in our Solar System. However, the parent star is so faint (less than a thousandth the luminosity of than the Sun), that they could potentially all be of the right temperature to host water. There have been many articles and commentaries about the possible conditions on the seven planets, three of which lie in what is normally called the “habitable zone” (i.e. where the surface temperature could allow liquid water) and all of which are classed as “temperate”, meaning that the right atmospheric density and composition could allow for liquid water. There are a lot of “coulds” in there, and we simply have no idea about their atmospheres – though it’s very possible that future telescopes, such as the planned Extremely Large Telescope and the soon-to-be-launched James Webb Space Telescope, will be able to make progress on that front. For now, all we know is how much starlight falls on the planets, and therefore what the temperature of a bare lump of rock would be. As shown in the image above, even though they are similar in that sense to Earth and Venus, that doesn’t tell us much. That’s perfectly illustrated by the fact that Earth (nice and temperate) and Venus (inhospitable hellhole) are so different. The Earth’s average surface temperature would be -15°C without the atmosphere, but is increased to about +15°C by the atmosphere. Venus, on the other hand, receives twice as much light from the Sun, but with its thick atmosphere has a surface temperature of about 500°C. 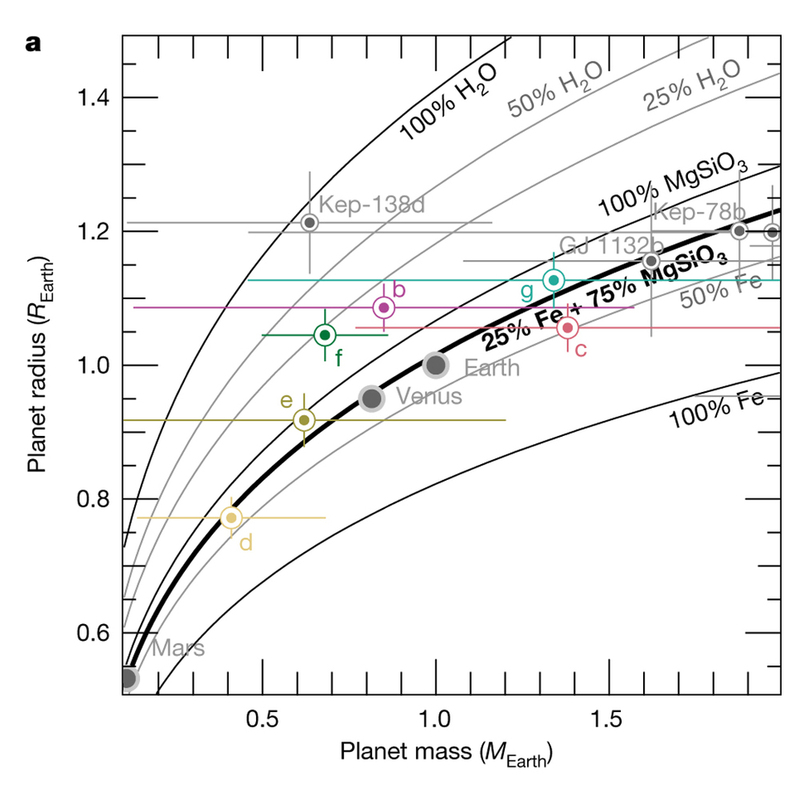 Put simply, although the right atmosphere could lead to nice temperature planets, the wrong atmosphere could equally lead to a very inhospitable planet. There are lots of neat things here just in the discover itself. 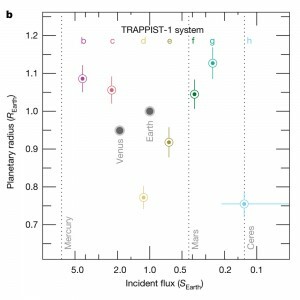 For example, the reason there was so much interest in this system was that the initial observations (by TRAPPIST and the Very Large Telescope) a few years ago caught a triple transit – where three planets passed in front of the star at about the same time (see left). That led the team to observe the system with a whole host of other telescopes – the Liverpool Telescope (in La Palma, despite its name), the William Herschel Telescope (also in La Palma), the UK Infrared Telescope (in Hawaii), the South African Astronomical Observatory 1m telescope (in, erm, South Africa), the Spitzer Space Telescope (in space, duh), and a northern-hemisphere twin of the original telescope, TRAPPIST-North (in Morocco) [TRAPPIST-1 is on the celestial equator so can, conveniently, be observed from the northern and southern hemispheres]. That’s a lot of telescopes, but having all these observations is key to uncovering the secrets of this unusual system. For me the really interesting thing is quite how much has been learned from transits. I mentioned above that the transit method normally only gives us the size of the planet. To get a planet’s mass (and therefore its density), we normally need to use another method, usually the Radial Velocity method, to pick out the weak gravitational effect of the planet on the star, causing the star to wobble a little bit. 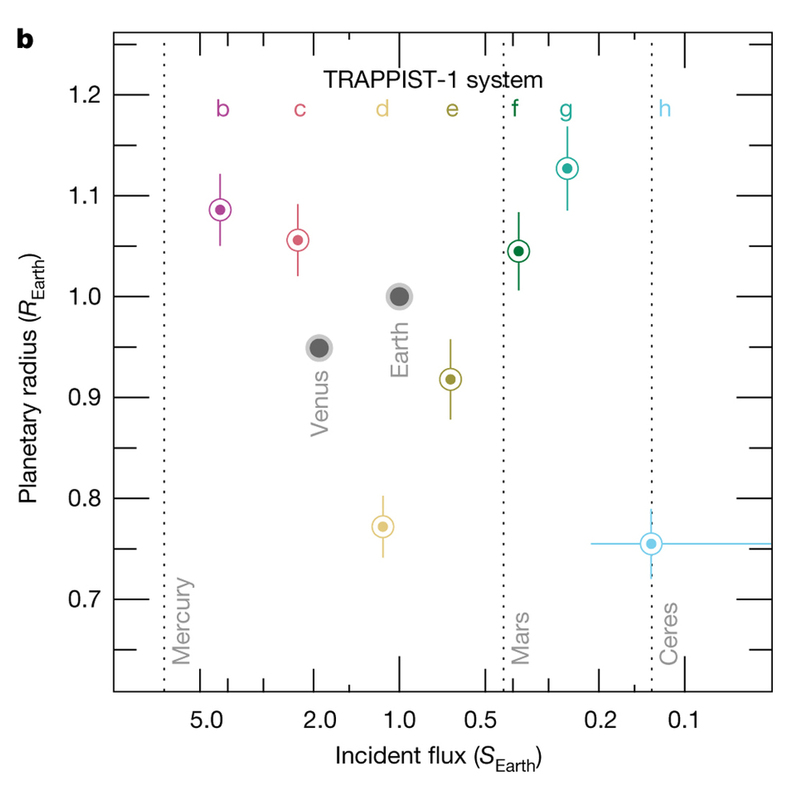 However, the TRAPPIST-1 system has another feature that helps us out – the planets are so close together that we can measure their gravitational effects on each other. There’s also a sort of synchronicity between the orbits. Take the 4th and 5th planets, called “e” and “f”, for example: for every two times planet “f” orbits the star, planet “e” orbits three times. That means that every other time “f” gets to a particular point in its orbit, planet “e” is in the same place. Having that repeatable pattern is something called a “mean motion resonance”, and there are links between all the planets. The image on the right shows the orbital periods and the “resonances” relative to the inner-most planet. We see this in our own Solar System. Three of Jupiter’s largest moons (Io, Europa and Ganymede) have orbital periods in the ratio of 1:2:4 (for Io:Europa:Ganymede) – so for every once Ganymede goes round, Europa goes round twice and Io four times. This keeps their orbits locked, means Europa’s orbit is slightly elliptical, and ultimately helps generate the heat that create Europa’s subsurface ocean. 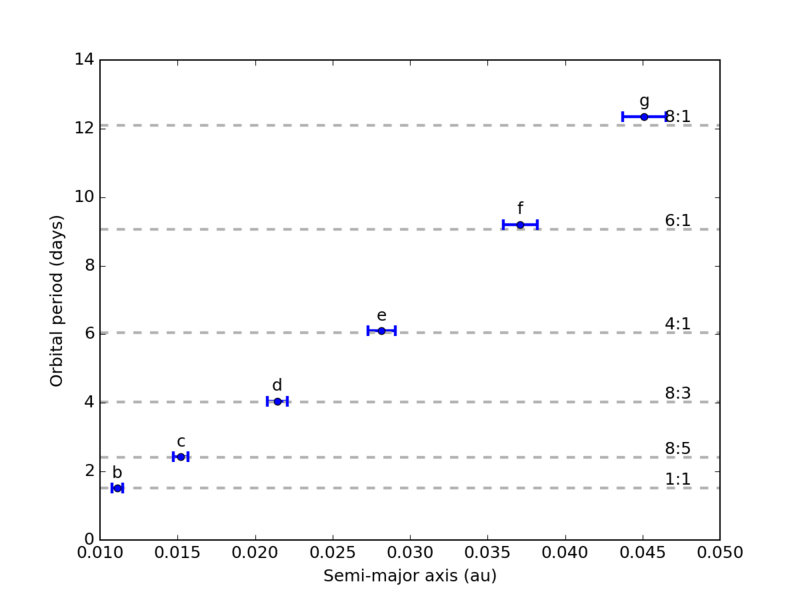 There are also resonances between the orbits of asteroids and Jupiter, as well as between Kuiper Belt objects and Neptune (with Pluto and Neptune having periods in a 3:2 ratio). These relationships mean that the planets have small, regular tugs on each other, effectively either slowing them down or speeding them up a bit. That changes the precise time that they pass in front of the star, which is something we can measure very accurately. 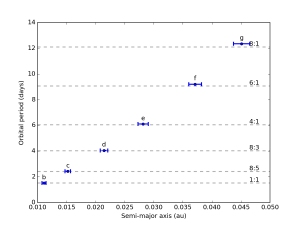 By predicting what the effect would be of different masses, and comparing that to the observed “transit time variations” (sometimes called TTV) it is possible to estimate the masses of the planets. Since such resonant systems have a habit of being unstable, and this one presumably has been there for a long time (unless we got really lucky! ), it may even be possible to even better constrain the masses of the planets. At the moment, those masses aren’t know very well, but it does start to give a handle on the density of the planets. The graph below shows the masses and densities along with some predictions of various compositions. Although two of the planets look like they could be “water worlds” (made largely of water), the uncertainties are large enough that they could also be your common or garden rocky planets. To get the masses better we need radial velocity measurements, but that could be tricky. I had a play with the Radial Velocity Simulator from the Nebraska Astronomy Applet Project, and put in the values for the closest planet (star mass = 0.08 Msun, planet mass=0.003 Mjup, semi-major axis=0.01au, inclination=90deg, ecentricity=0) to see the size of the effect. The planet’s mass are so small that it would only cause the star to wobble by about 2m/s, which is, in principle, within reach of the best instruments on the largest telescope, but the issue may well be that the star is too faint to get a strong enough signal. I’m not an expert on the intricacies of radial velocity measurements, though, and would be delighted to be proved wrong! 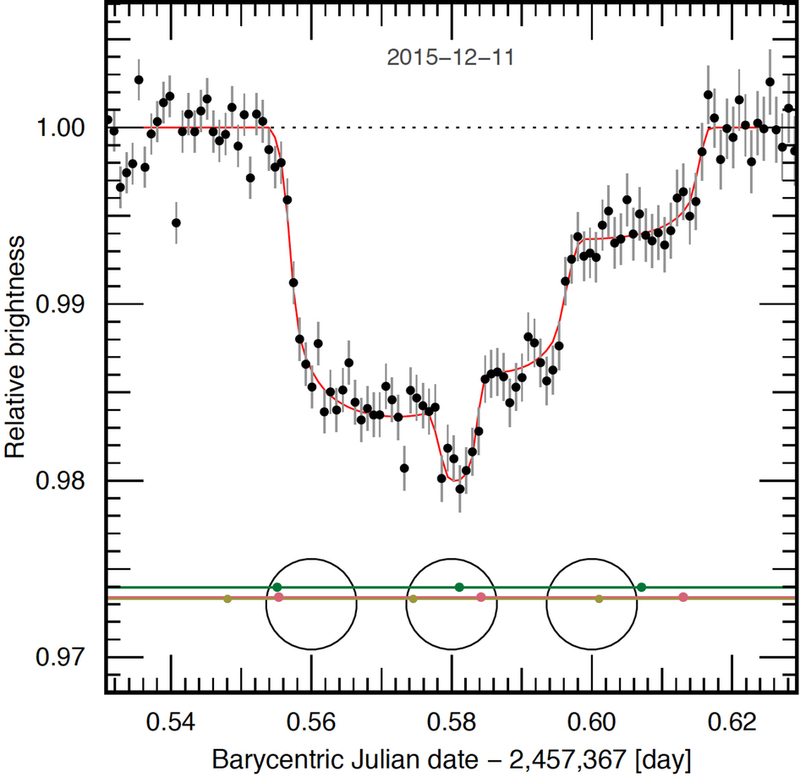 This entry was posted in Exoplanets, Science and tagged exoplanets, resonance, science, trappist-1 on February 24, 2017 by Chris North. It’s a year since the LIGO Scientific Collaboration, including the Gravitational Physics group here in Cardiff, announced the very first detection of gravitational waves. I’ve been working with the teams in Cardiff and internationally for a little over a year, and it’s been a rollercoaster. The announcement day itself was, quite frankly, crazy – but a good kind of crazy (radio interviews, live TV interviews on the roof, videos, podcasts, press conferences etc.). Since then I’ve given a number of interviews, public talks and school workshops about the detection and it’s all still as amazing as it was a year ago. It says something that to express the power you need not one but two non-standard expressions of magnitude (septillion and yotta) – though since “yotta” and septillion both mean 1024, I can’t help thinking that it might sounds better as a “yotta-yotta-Watt”! I also took this opportunity to update the Gravitational Wave Catalogue I made a while ago (fullscreen version here). You can change the axes on the graph, and show more information about the detections. The second Advanced LIGO run began on November 30, 2016 and is currently in progress. As of January 23 approximately 12 days of Hanford-Livingston coincident science data have been collected, with a scheduled break between December 22, 2016 and January 4, 2017. Average reach of the LIGO network for binary merger events have been around 70 Mpc for 1.4+1.4 Msun, 300 Mpc for 10+10 Msun and 700 Mpc for 30+30 Msun mergers, with relative variations in time of the order of 10%. So far, 2 event candidates, identified by online analysis using a loose false-alarm-rate threshold of one per month, have been identified and shared with astronomers who have signed memoranda of understanding with LIGO and Virgo for observational followup. A thorough investigation of the data and offline analysis are in progress; results will be shared when available. The “reach” of the LIGO is defined by its sensitivity – because more distant events are fainter and so harder to detect (meaning that a more sensitive detector network can detect more distant events. The reason for giving three distances for different mass pairings is because more massive binaries produce stronger signals so can be “seen” further away – historically the range of gravitational wave detectors has been stated as the 1.4+1.4 Msun mergers (i.e. two neutron stars). In terms of scale a Mpc is a “megaparsec” (one million parsecs), which is about 3.26 million light years. The Andromeda Galaxy (our nearest large neighbour) is about 2.5 million light years (0.75 Mpc) away. The Virgo cluster of galaxies, the closest large galaxy cluster, is about 50 million light years (15 Mpc) away, so well within range of LIGO. Though do remember that the previous detections were much further away than that – at around 1 billion light years. 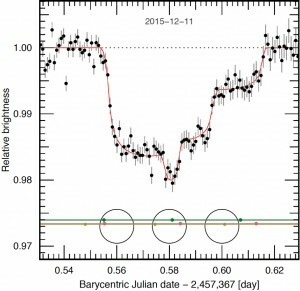 This entry was posted in Gravitational Waves, Science on February 11, 2017 by Chris North.